The term “Powder Post Beetle” can be used to indicate any of three closely related families (Lyctidae, Bostrichidae and Anobiidea Beetles) within the super family Bostrichoidea. This common name is appropriate because the larvae of these beetles can reduce timbers to a mass of very fine, powder like material with hollowed out areas in the wood as shown in the photo to the right. The adults do very little actual damage to wood, serving primarily a reproductive function. Powder Post Beetle larvae cause millions of dollars worth of damage in the United States each year and are second only to termites in their destructiveness. Adult beetles lay their eggs in the surface pores of wood. The larvae bore into the wood as soon as they hatch. Living in the wood, they create tunnels called galleries as they eat their way through the timbers. When the larvae are nearly full grown, they bore near to the surface of the wood and pupate. The adults bore out through the surface soon after pupation, pushing a fine powdery wood dust, usually a copper to yellow-gold in color, out of the wood as they emerge. They are small, varying in size from 3/32 to 7/32-inch long, and are reddish-brown to black in color. Pin hole openings, often called shot holes, perforate the surface of infested wood. Infestations are often built into structures as a result of using infested lumber. In hidden areas such as crawl spaces and basements, serious damage may be done before the infestation is discovered. Inspection by a pest professional is the best way to determine if an infestation has occurred and immediate treatment will halt any further damage. 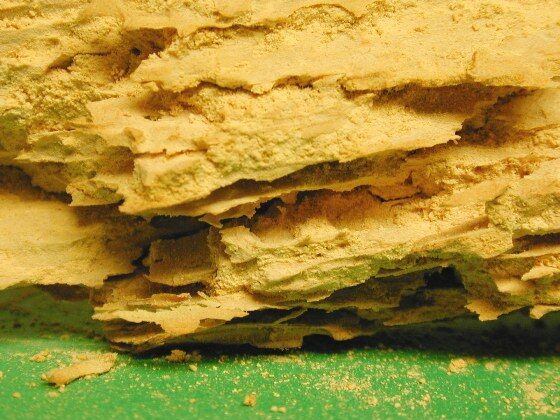 Note: Powder post beetle treatment differs from a termite control treatment. To treat for termites we need to inject the soil around the house. To treat for powder post beetles we treat all affected wood areas directly with an odorless, low toxicity treatment that lasts for many years.